Tamarillo, also known as a tree tomato, is a bright red or golden, egg-shaped topical fruit native to South and Central America. Tamarillos are grown commercially in South and Central America, Australia, Africa and Asia. In the United States, the fruit is grown primarily in California. The tamarillo is rich in vitamins, A, B6, C, E, fiber and antioxidants. Although the outer covering is bitter, the fruit of the tamarillo is juicy and flavorful. Eat the tamarillo as a snack or use the colorful exotic fruit in a myriad of ways. Wash the tamarillo under cool water. Cut the tamarillo in half with a paring knife, cutting the fruit crosswise. Sprinkle the tamarillo with sugar, then eat the tamarillo fruit directly out of the peel, using a spoon. Don't eat the peel, which is bitter and unpalatable. Rinse the tamarillo. 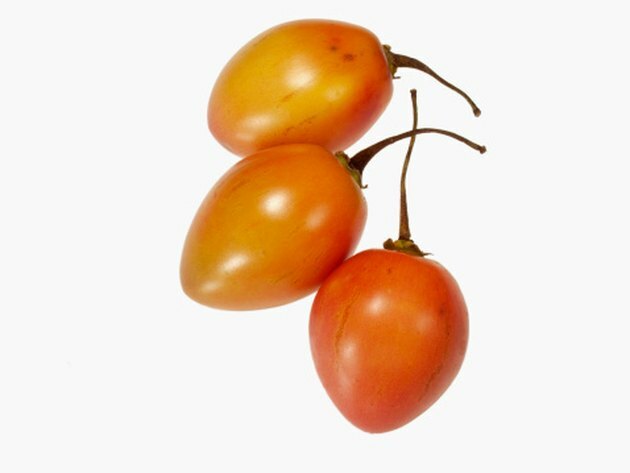 Place the clean tamarillo in a heat-proof glass or ceramic bowl. Pour boiling water over the tamarillo. Use enough boiling water to cover the fruit. Allow the tamarillo to remain in the hot water for 3 to 4 minutes. Drain the hot water and replace it with fresh water to cool the tamarillo. Use the tip of a paring knife to grab a bit of the peel. Slide the peel off the fruit. Cut a raw tamarillo into slices, then serve the slices with sliced cheese or crackers or add the slices to a tossed salad. Make an easy salsa by chopping raw tamarillo and mixing it with avocado and a chopped chili pepper, or use chopped tamarillo with apple, onion, vinegar and spices for a flavorful chutney. Chop a peeled tamarillo and blend it in a fruit smoothie with yogurt, honey, milk, ice cream and a banana. Use a peeled tamarillo in a variety of baked goods, dishes and desserts. Combine a chopped, peeled tamarillo with applesauce, then serve the mixture on ice cream. Add chopped, peeled tamarillos to bread or muffins or incorporate the peeled tamarillo in pork dishes. You can also use a chopped tamarillo to top a pizza.